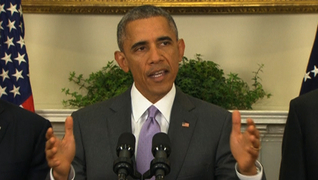 WATCH: President Obama Seeks Authorization for War Against Islamic State | Democracy Now! 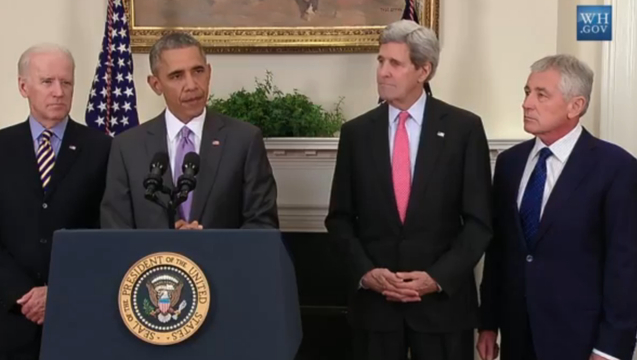 Watch President Obama’s live statement seeking congressional authorization for war against the Islamic State. Join the discussion on the Democracy Now! Facebook page. My Administration’s draft AUMF would not authorize long-term, large-scale ground combat operations like those our Nation conducted in Iraq and Afghanistan. Local forces, rather than U.S. military forces, should be deployed to conduct such operations. The authorization I propose would provide the flexibility to conduct ground combat operations in other, more limited circumstances, such as rescue operations involving U.S. or coalition personnel or the use of special operations forces to take military action against ISIL leadership. It would also authorize the use of U.S. forces in situations where ground combat operations are not expected or intended, such as intelligence collection and sharing, missions to enable kinetic strikes, or the provision of operational planning and other forms of advice and assistance to partner forces.